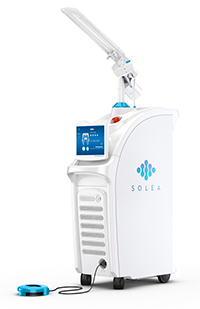 Now available to our patients, Solea is a powerful dental laser that replaces the dental drill in the majority of procedures in our practice. It causes virtually no pain, vibration, or noise. Solea is changing the way we practice dentistry while changing the lives of the people we care about most – you, our patients! Solea is the first CO2 dental laser system cleared by the FDA for hard- and soft-tissue procedures. It was developed in Boston, Massachusetts by Convergent Dental, based on research conducted at the University of California School of Dentistry. Solea offers a unique wavelength guided by sophisticated computers to deliver virtually painless dental procedures for both teeth and gums, from simple cavities to complex surgeries. Not only is the laser virtually painless, it is also vibrationless and noiseless. The experience is so unique that you will find it hard to believe you have been at a dental appointment. Solea’s technology offers patients an anesthesia-free alternative to the traditional drill for hard and soft tissue procedures. Its unique wavelength provides a natural anesthetic effect for patients, while Dr. Henkenius has the ability to cut dental enamel without using a drill. It has won countless awards, including Popular Science Best of What's New Award, Gold winner in the 17th Annual Medical Design Excellence Awards, and the American Dental Association's Annual Dr. Bicuspid Excellence Award! Blood-free and anesthesia-free procedures represent a major leap forward in dentistry: We are able to execute multi-quadrant dentistry, fillings on the fly, and soft-tissue procedures in a single appointment.